It only took one pub meal and one English breakfast for me to realize that the meat in the UK really, really freaks me out. I've always flirted with the idea of becoming a vegetarian - I'm no passionate carnivore, but I'm certainly no ardent animal rights activist either. Meat is something I can easily limit to one serving a day, but let's be honest, homegirl still loves her bacon. That said, British mystery meat terrifies me. (I'm getting grossed out just writing about it.) The taste, the texture, the subsequent stomach ache... it's all disgusting if you ask me (and certainly a far cry from my beloved organic/hormone free/happy/free range chicken and beef from Whole Foods). I had such high hopes for bangers & mash at authentic English pubs... but all I got was disappointment. Nevertheless, I decided to be a vegetarian during my week in London to further avoid these strange substances that the British call "meat". Thankfully, London is incredibly veg-friendly and has a plethora of delicious health food options. As much as I usually like to "sightsee with my tastebuds" and eat like the locals do, this time around I stuck to places I knew I wouldn't get sick from gluten or bombarded by mystery meat. 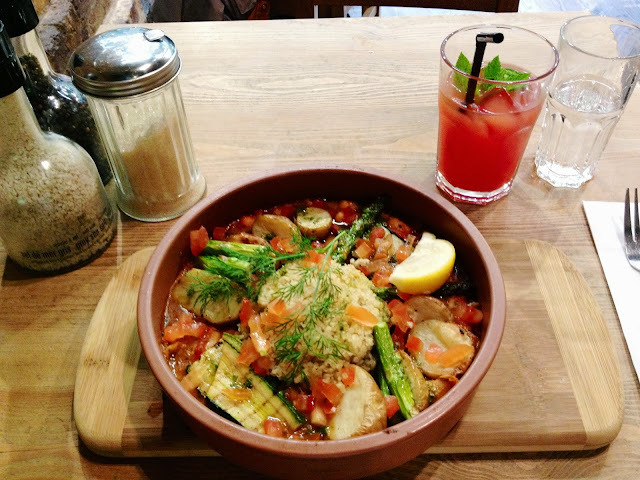 Some of my favorite places to get affordable healthy meals were Le Pain Quotidien, Pret a Manger and Food for Thought. - Common sense: eating less meat is a lot better for you!! With all that said, for me being a vegetarian certainly isn't sustainable in places where it's harder to find gluten free food, which will probably be the case as I travel to different places around Europe. But overall it was a positive experience, so we'll see if I try it again! Until then, I'll be indulging on delicious jamón ibérico and chicken paella in Madrid. And a major shout out to all my Celiac/gluten intolerant vegetarian friends... I really don't know how you do it all the time. 1 comment on "London: My Week As a Vegetarian"
I have heard from a few that the English food is a little different but that it is a beautiful place to visit! I hope you had a lovely time!